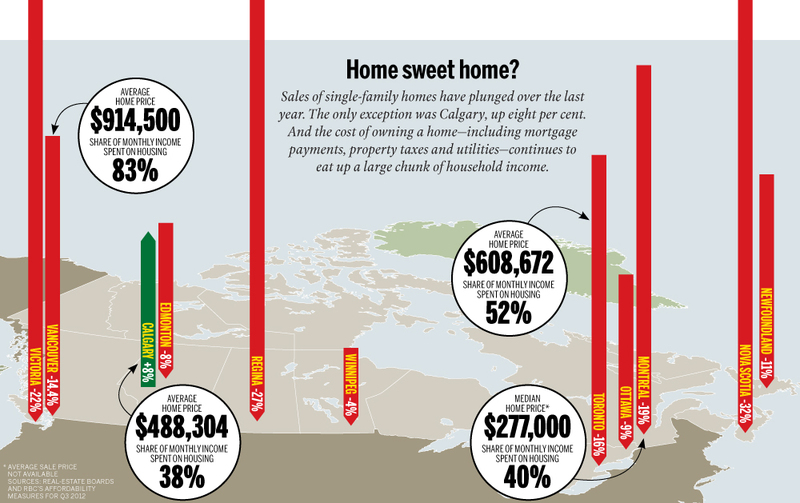 interesting article and graphic from canadian business…. The next highest on the list is Hong Kong, at 69%. The lowest is Japan, whose market is undervalued by 37%. America’s is undervalued by 7%. The other metric used, price-to-income, doesn’t really paint a rosier picture for Canada. By this measure, the Canadian market is overvalued by 34%, second only to France at 35%. But whether or not a serious correction is beginning—or already here—remains a contentious notion. According to the latest StatsCan report, the house-price index rose 0.1% in November. The main contributor, says StatsCan, was Ontario, specifically Toronto and Oshawa. But Vancouver, notorious for being the most expensive market in Canada, saw a decline, as did its provincial neighbour, Victoria. Indeed, on the other end of the spectrum, Canadian Business’s sister magazine, Maclean’s, is saying a crash, or at least a correction, has already begun. One of the big warning signs for a looming drop in prices is a decrease in sales, which, as this graphic shows, is apparent in every major city across Canada—with the exception of Calgary. Whether that drop in sales portends a crash, a correction or a blip remains to be seen. That said, The Economist’s latest data is ammunition for the bears. Wishing everyone a happy, healthy, and profitable New Year!!! !